Six endophytic bacteria of corn roots were identified as Bacillus sp. and as Enterobacter sp, by sequencing of the 16S rRNA gene. Four of the strains, CNPSo 2476, CNPSo 2477, CNPSo 2478 and CNPSo 2480 were positive for the nitrogen fixation ability evaluated through the acetylene reduction assay and amplification of nifH gene. Two Bacillus strains (CNPSo 2477 and CNPSo 2478) showed outstanding skills for the production of IAA, siderophores and lytic enzymes, but were not good candidates as growth promoters, because they reduced seed germination. However, the same strains were antagonists against the pathogenic fungi Fusarium verticillioides, Colletotrichum graminicola, Bipolaris maydis and Cercospora zea-maydis. As an indication of favorable bacterial action, Enterobacter sp. CNPSo 2480 and Bacillus sp. CNPSo 2481 increased the root volume by 44% and 39%, respectively, and the seed germination by 47% and 56%, respectively. Therefore, these two strains are good candidates for future testing as biological inoculants for corn. Literature shows that some bacteria, which live attached to plants have the ability to promote plant growth (Compant et al. ; George et al. ; Beneduzi et al. ). These microorganisms have attracted attention because of the need to reduce the use of chemicals, especially when considering the context of sustainable agriculture and environmental protection (Vale et al. ). One of the strategies is to exploit the benefits that several microorganisms may give to plants when added as inoculants (Lucy et al. ). Bacteria promoting plant growth can act directly, through one or more mechanisms, including biological nitrogen fixation (Ashraf et al. ; Verma et al. ), phosphate solubilization (Rodriguez et al. ; Krey et al. ), production of hormones such as auxins, gibberellins and zeatin (Cassan et al. ), or act indirectly by means of biological control of pathogens (Wang et al. ). In addition, some studies point out to the preferred action with endophytic microorganisms or adapted isolates, due to easier colonization and the lower risk to introduce exogenous organisms (Enebak et al. ; Khalid et al. ). Several studies have shown the positive effects of endophytic bacteria inoculation in plants, e.g. sugarcane (Saccharum spp. ), leading to increased contribution of biological nitrogen fixation, to promotion of root development, increased biomass and productivity (Oliveira et al. ); soybean (Glycine max (L.) Merr. ), with bacteria capable to inhibit growth and sporulation of pathogenic fungi (Assumpção et al. ); tomato (Lycopersicum esculentum L.), with bacteria increasing plant height, leaf area, leaf number, together with fresh and dry plant weight (Barreti et al. ). Benefits provided by the inoculation of corn (Zea mays L.) with selected strains have also been described, including the promotion of growth due to the increased availability of nutrients, provided by inoculation with B. subtilis in seeds (Canbolat et al. ). In addition, there are reports of strains of Azospirillum brasilense increasing corn yield by 24% to 30%, compared to the non-inoculated control (Hungria et al. ). However, for the selection of isolates that have a greater chance of being efficient in the process of colonization and growth promotion, the isolates have first to be identified with preliminary in vitro biochemical analysis (Pal et al. ; Berg et al. ; Bernardes et al. ).Taxonomy of selected microorganisms with biotechnological potential in agriculture is thus a key step and, for this reason, sequencing of the 16S rRNA has been successfully used to identify genera such as Bacillus (Porwal et al. In , Deepa et al. ), Rhizobium, Burkholderia (Ferreira et al. ), Enterobacter, Pantoea Serratia, among others (Tian et al. ). The aim of this study was to evaluate and characterize the properties of endophytic bacteria isolated from corn roots, with the potential to have biotechnological interest for their use in agriculture. The seven bacteria studied belong to the Laboratory of Microorganisms Genetics Collection (LABGEM) of the Federal University of Parana, and are deposited at the Diazotrophic and Plant Growth Promoting Bacteria Culture Collection of Embrapa Soja (WDCC Collection # 1054), with the record numbers from CNPSo 2475 to CNPSo 248. GeneBank accession numbers for the 16S rRNA go from JQ821359 to JQ821365. These bacteria were isolated from corn roots samples by Ikeda et al. (). For the isolation, corn roots from field trial conducted at Semilia Genetics and Breeding LTDA, located in the southern Brazilian region of Campo Largo-PR, were surface-sterilized (Petrini, ) and aseptically cut, then transferred to Petri dish plates containing solid culture media. Several controls confirmed that the sterilization procedure was effective. The fungi Cercospora zea-maydis (MMBF 51/08) and Bipolaris maydis (MMBF 46/08) were kindly provided by the Biological Institute of São Paulo, taken from the Micoteca “Mario Barreto Figueiredo”. The Fusarium verticillioides (CMM-1060) and Colletotrichum graminicola (CMM-1061) were deposited in the Culture Collection of Phytopathogenic Fungi “Prof. Maria Menezes”, with GenBank accession numbers for the 18S rRNA of KC335155 and KC335154. Genomic DNA was obtained using the Raeder and Broda protocol (), with the following modifications: bacteria were grown overnight in 4 mL of DYGS medium (Rodrigues Neto et al. ) and then centrifuged for 2 min at 10.000 g. Then, a 2 mL pellet of extraction buffer (125 mMol/L Tris–HCl pH 8.0; 2 Mol/L NaCl; 50 mMol/L EDTA pH 8.0 and 1% SDS pH 7.2) was added, preheated at 60°C. After drying, the DNA was re-suspended in 50 μL of ultrapure water. The integrity was checked by electrophoresis on agarose gel 0.8% (w/v), stained with GelRedTM (Biotium, USA), diluted in a sample buffer for 100X, observed in a UV transluminator (Ultraviolet Benchtop transilluminators) and photo-documentation application (Program Digidoc it Quantification). Purity was evaluated by spectrophotometer (per wavelength) NanoDrop® 2000 (Thermo Scientific). The amplification was performed by PCR (Polymerase Chain Reaction) with primers fD1 (5′AGA GTTTGATCCTGGCTCAG 3′) and rD1 (5′AAGGAGGTGATCCAGCC 3′) (Weisburg et al. ). The cycle included an initial denaturation at 95°C for 2 min, 30 cycles of 15 s at 94°C, 45 s at 93°C, 45 s at 55°C, 2 min at 72°C, followed by a final extension of 5 min at 72°C. Purification with 7.5 M ammonium acetate was performed according to Menna et al. (). Ultrapure water was used to re-suspend the DNA. The amount and purity were assessed as described above on agarose gel 1.5% (w/v), adjusting the final concentration at 16 ng/μL. For the second PCR reaction, the following primers, designed by Prof. Leonardo M. Cruz (Dept. Biochemistry, Federal University of Paraná, Curitiba, PR, Brazil), were used: 362f (5′ CTCCTACGGGAGGCAGCAGTGGGG 3′), 786f (5′ CGAAAGCGTGGGGAGCAAACAGG 3′), in addition to the fD1 primer (Weisburg et al. ). Eighty ng of the purified product from the first PCR reaction, 0.25 mM of primer and 2 μL ET mixture were used for sequencing. Ultrapure water was added to reach the final volume of 10 μL. Amplification was performed for 35 cycles of 30 s at 94°C, 15 s at 50°C and 90 s at 60°C. After amplification, purification was performed with Sephadex™ filtration gel, G-50 medium (GE® Healthcare) and then the product was submitted to electrophoresis with an automated DNA sequencing analyser, model MegaBACE1000 (Amersham Biosciences®). The quality of the bases and the fragment assembly were analyzed with the PhredPhrapConsed software (Ewing et al. ). Alignments were carried out with the PRANK software (Löytynoja and Goldman ). The percentage of similarity was obtained from the RDP (Ribosomal Database Project). The phylogenetic analysis was made using Bayesian inference with the MrBayes 3.1.2 software (Ronquist and Huelsenbeck ) using parallel computing (Altekar ), with four chains. The evolutionary model was selected through the JModelTest program (Posada and Kandral ). The number of generations and “burn-in” were defined by analysis of multiple sequences, with topological stability assessment by the AWTY package (Nylander et al. ) and analyzed by the parametric stability software, Tracer 1.5. With appropriate values of “burn-in”, the final trees were summarized with the software package SumTrees DendroPy 3.8.1 (Sukumaran and Holder ). The PCR was performed with primers nifH F (5′ TACGGNAARGGSGGNATCGGCAA 3′) and nifH I (5′ AGCATGTCYTCSAGYTCNTCCA 3′) (Boldface letters denote degenerate positions N = A + C + G + T; R = A + G; S = G + C; Y = C + T; W = A + T), as follows: 1.5 mM MgCl2; 20 μM (each) dATP, dCTP, dTTP,dGTP; 0.1 μM (each) primers; 0.04 U Taq DNA polymerase/μL. The modified steps for amplification were: an initial denaturation at 94°C for 2 min, 30 cycles of 1 min 94°C, 1 min at 55°C, 3 min at 72°C, followed by a final extension of 5 min at 72°C (Laguerre et al. ). With another pair of primers nifH-F (5′ AAAGGYGGWATCGGYAARTCCACCAC 3′) and nifH-R (5′ TTGTTSGCSGCRTACATSGCCATCAT 3′), the following steps were performed in the PCR: a 4-min hot start at 97°C before Taq DNA polymerase was added; 1 cycle of denaturation at 96°C for 20 s, annealing at 65°C for 30 s, and elongation at 72°C for 30 s; 2 cycles of denaturation at 96°C for 20 s, annealing at 62°C for 30 s, and elongation at 72°C for 35 s; 3 cycles of denaturation at 96°C for 20 s, annealing at 59°C for 30 s, and elongation at 72°C for 40 s; 4 cycles of denaturation at 96°C for 20 s, annealing at 56°C for 30 s, and elongation at 72°C for 45 s; 5 cycles of denaturation at 96°C for 20 s, annealing at 53°C for 30 s, and elongation at 72°C for 50 s; 25 cycles of denaturation at 94°C for 20 s, annealing at 50°C for 45 s, and elongation at 72°C for 60 s; and an extension at 72°C for 10 min (Rösch et al. ). Products of the PCR were confirmed in 1.5% (w/v) agarose gels. A Low DNA Mass Ladder (Invitrogen®) and photo-documentation, as described above. Biological nitrogen fixation was verified according to the methodology of Döbereiner et al. (), by using NFb semi-solid medium (Baldani et al. ). The target was the formation of a sub-surface pellicle. The nitrogen-fixation ability was confirmed by using the ARA (acetylene reduction assay), as described by Boddey (). Each bacterial isolate was inoculated into 10 mL vials containing the respective 4 mL semi-solid N-free medium NFb (Baldani et al. ), TBNR (Seldin et al. ) and LGD (Döbereiner ). All isolates were incubated at 30°C in the dark. After 24 h, 10% (v/v) of the air phase was replaced with acetylene (Burris, ) and then the vials were incubated again. After the addition of acetylene, three vials for each isolate were sampled over 1 h to determine the amount of ethylene. Ethylene was measured using a Clarus 600 gas chromatograph (PerkinElmer®) with a Col-Elite-Alumina column and a flame ionization detector connected to a chromatography data computer system. Azospirillum brasilense Ab-V5 was used as positive control. Quantification of indoleacetic acid (IAA) was performed according to Kuss et al. (). Single bacterial colonies were inoculated in 2 mL of DYGS medium supplemented with 2 mg/mL of tryptophan and incubated at 30°C for 72 h at 180 rpm. IAA was measured by mixing 1 mL broth with 1 mL of Salkowsky’s reagent (Loper and Schroth, ) and incubated for 30 min at room temperature. Bacterial cells were separated from the supernatant by centrifugation at 10,000 rpm for 5 min and absorbance at 530 nm was determined. A standard IAA curve was plotted with commercial auxin (Sigma Aldrich, USA) and correlated with the absorption of the bacterial strains. Values are expressed in μg/mL. The confirmation of siderophore production was performed according to Schwyn Neilands () universal method, with Chrome Azurol S-(CAS) in Petri dishes, with DYGS solid medium. The spot was inoculated with test organism and incubated at 30°C for 3–5 days. Development of a yellow–orange halo around the colony was considered as a positive result. Solubilization of calcium phosphate was done according to Sylvester-Bradley et al. (). Bacteria were grown in GY (glucose yeast medium) (10 g glucose, 2 g yeast extract and 15 g agar per liter). Two other solutions were prepared separately, one containing 5 g K2HPO4 in 50 mL of distilled water, and the other containing 10 g CaCl2 in 100 mL of distilled water. These solutions were added to one liter of GY medium just before pouring onto Petri dishes, and together they formed an insoluble layer of calcium phosphate that made the medium opaque. Clear halos around the colony were recorded as a positive result (after 12 days). Confirmation of the production of ammonia was done by colorimetric reaction, by adding 1 mL Nessler’s reagent to a 72-h-old culture grown in peptone broth and recording the presence of the yellowish brown color (Dye ). For hydrocyanic acid (HCN), the Bakker and Schippers () method was followed in King B medium (King et al. ), supplemented with 4.4 g/L of glycine. HCN production was inferred with change in the color of the filter paper previously dipped in 2% sodium carbonate prepared in 0.05% picric acid, and it was rated visually depending on the intensity of the color change from yellow to dark brown. Bacteria were seeded in a mineral medium containing 0.5% carboxymethylcellulose as sole carbon source for detection of cellulose activity. Colloidal chitin at 0.08%, obtained according to Moura et al. () for the detection of chitinase and 0.5% of laminarin for the detection of β-1,3-glucanase (Renwick et al. ) were used. The amylolytic and pectinolytic activities were evaluated after Hankin and Anagnostakis (), in a minimal M9 medium (Sambrook and Russell ) containing 0.5% of yeast extract and 0.2% soluble starch (v/w) to test for amylase, and pectin 0.5% (v/w) to test for pectinase. The proteolytic activity of strains was verified through the degradation of casein in half-skimmed milk agar (Berg et al. ). The appearance of a halo around the colonies was recorded as positive (after seven days). The paired cultures test was performed according to Shiomi et al. (), with potato dextrose agar (PDA) medium, using two equidistant grooves and a 5 mm disc of fungi mycelia placed in the center of the plate, grown for five days. The inhibition activity was evaluated by measuring the radius of fungal growth and comparing it with the control that was not treated with bacteria. A bacterial cell suspension was incubated at 30°C for 24 hours at 150 rpm in DYGS medium. Then the suspension was centrifuged at 5.000 g and re-suspended in saline solution (0.85% NaCl). The concentration was adjusted to 2×109 CFU/mL, in a spectrophotometer, to OD540 nm, from an exponential growth curve previously performed. One mL of this solution was inoculated into 100 commercial hybrid corn seeds SX2530 (Semilia LTD), previously surface disinfested (Shiomi et al. ); tissues were also internally disinfected with warm water to eliminate fungi (Daniels ). To confirm the disinfection, samples of seeds were germinated in Petri dishes with PDA medium. The amount of cells in the seed was measured by doing plate counts (CFU). Bacteria were extracted by using 0.085% saline solution agitated by vortexing (Silva and Reis ). Seeds were germinated in an incubator at 28°C, on filter paper moistened with distilled water. Evaluations of the length (cm) and volume (cm3) of the root and of the hypocotyl were made after 4 and 7 days (Cassán et al. ) using the Win-rhizo v.4.0 software (Regent Systems, Quebec, Canada). Statistical analysis were performed on the Assistat 7.6 Beta software, and the data were set to 5% confidence level (p > 0.05). After aligning the sequences of the gene 16S rRNA, a region of 1512 bp was used for phylogenetic analysis, along with type strains taken from the RDP. Strain CNPSo 2480 grouped with the Enterobacter branch with 100% Bayesian posterior probability (BPP). This same strain had a 96% BPP and 98% similarity with type strain E. asburiae JCM6051 T . The six other bacterial strains belong to the genus Bacillus. Among them, CNPSo 2481 showed 100% BPP and 98% similarity with B. pumilus DSMZ27 T (Figure 1). Phylogenetic tree based on the 16S rRNA gene sequence of the isolates in this study and reference strains obtained from the RDP. Used were 1512 bp fragment after alignment. Data generated using Bayesian inference, with outgroup Alicyclobacillus herbarius. Suportes branches less than 50% were not shown. The sequences of strains CNPSo 2479 (LGMB227), CNPSo 2476 (LGMB163), CNPSo 2477 (LGMB128), CNPSo 2480 (LGMB184), CNPSo 2481 (LGMB186), CNPSo 2475 (LGMB155), CNPSo 2478 (LGMB135) were deposited at the Genbank and received the accession numbers of JQ821359 to JQ821365. Strains Bacillus CNPSo 2477 and CNPSo 2476 were positive for nifH gene amplification (primers nifH F and nifH I), producing an amplified fragment of about 780 bp. Enterobacter sp. CNPSo 2480 was positive for the two pairs of primers tested (nifH F and nifH I; nifH- F and nifH- R). Bacillus sp CNPSo 2478, amplified with the second primer, resulted in a fragment of about 400 pb. In relation to the nitrogen fixation capacity evaluated in vitro, all strains were able to grow in NFb semi-solid medium and showed the typical pellicle. But only Enterobacter sp. CNPSo 2480 showed the ability to reduce acetylene to ethylene in NFb N-free semi-solid medium. Bacillus CNPSo 2476, CNPSo 2477and CNPSo 2478 showed the same property in TBNR and LGD. Only Enterobacter sp. CNPSo 2480 did not produce siderophore and Bacillus sp. CNPSo2481 produced ammonia. All strains were positive for IAA production with values between 35.1 and 96.3 μg/mL, especially Bacillus CNPSo 2477 and CNPSo 2478, with 105.2 and 105.11 μg/mL respectively. Lytic enzymes activities were detected in the following strains: cellulase CNPSo 2477, CNPSo 2475 and CNPSo 2476; amylase CNPSo 2477, CNPSo 2478, CNPSo 2475 and CNPSo 2476; pectinase CNPSo 2477, CNPSo 2478, CNPSo 2475, CNPSo 2476 and CNPSo 2479; protease, for degradation of casein CNPSo 2478, CNPSo 2475, CNPSo 2476, CNPSo 2481 and CNPSo 2479. All strains were negative for all phosphate solubilization tests, production of HCN, chitinase and β1,3-glucanase. The seven bacterial strains significantly reduced the growth of fungi, with inhibition above 70% of the following pathogens: CNPSo 2477 (B. maydis, C. graminicola and C. zea-maydis); CNPSo 2478 (B. maydis and C. graminicola); CNPSo 2475 (C. zea-maydis); and CNPSo 2476, CNPSo 2480, CNPSo 2481, CNPSo 2479 (C. graminicola and C. zea-maydis). The inoculation resulted in 107 CFU/seed. The strains Bacillus sp. CNPSo 2477 and CNPSo 2478 reduced the germination percentage by about 27%. In contrast, germination increased to approximately 52% with CNPSo 2475, CNPSo 2480 and CNPSo 2481. CNPSo 2476 and CNPSo 2479 increased germination to about 36.5% and 15.8%, respectively. The bacteria CNPSo 2476, CNPSo 2480 and CNPSo 2481 promoted root volume increases (14.6%, 43.9% and 39.02% respectively). CNPSo 2480 and CNPSo 2481 also promoted an increment in root length. No changes were observed in hypocotyl length and volume. Sequencing of 16S rRNA allows the accurate identification of bacterial genera endophytes from various plant species, including: sugar cane (Ratón et al. ), corn (Pereira et al. ) and rice (Oryza sativa L.) (Beneduzi et al. ). However, for the precise definition of species and even subspecies such as Bacillus subtilis the analysis of other genes, such as gyrA (Chun and Bae ) is needed. All strains from this study showed an indication of the nitrogen fixation by the formation of the typical pellicule in semi-solid N-free medium. However, in only four strains (CNPSo 2476, CNPSo 2477, CNPSo 2478 and CNPSo 2480) the nifH gene was amplified. The nitrogen fixation genes are found in different phylogenetic groups (Affourtit et al. ). Among them, nifH is one of the oldest and most functional (Rosado et al. ) and its amplification by degenerative primers is a useful tool to confirm fixation potential (Zehr et al. ). However, if amplification does not occur with these primers, it does not mean that the strains are not capable of nitrogen fixation, because the gene may have different nucleotide sequences between species and even within the same species Zehr et al. (). In our study, the four strains that amplified nifH with different primers were also positive to the ARA test. This result indicated that strains have the possibility to fix nitrogen. Montañez et al. () also verified the same situation in bacteria with nitrogen fixation capability by the reduction of acetylene to ethylene and confirmed by PCR the presence of nifH gene. The group of Bacilli was reported to be capable of nitrogen fixation, Ratón et al. () and Rana et al. () working with ARA-positive strains, indicated suitable environments for searching new inoculants or candidates for biotechnological purposes. In our study, all strains produced IAA, although in different amounts. Bacteria that produced lower levels (CNPSo 2480 and CNPSo 2481), had bigger influence on root elongation and root volume, characteristics of great interest that provide greater surface area for the absorption of nutrients. The effects of the auxin depend on its concentration, i.e. when it is low it can stimulate growth and when it is high can be inhibitory, same for seed germination (Arshad and Frankenberger ). This may occur because the IAA can modify the endogenous auxin of the plant to an optimal or deleterious level (Patten and Glick ). For example, Sarwar and Kremer (), by comparing the production of auxin between promoting and inhibiting bacteria growth, noted that the latter produced high levels and inhibited root growth of Convolvulus arvensis; Baranzani and Friedman () observed the same effect with lettuce (Lactuca sativa L.). Araujo and Guerreiro (), working with Bacillus, found that most strains of corn identified as growth promoters did not correspond to those producing higher levels of IAA. The species Pseudomonas fluorescens, whose production of IAA was only 15.63 μg/mL, increased root length in corn plants, according to Hernández-Rodríguez et al. (). The ability to produce siderophores has been reported in Bacillus (Pereira and Castro-Silva, ; Kumar and Kumar ) and Enterobacter (Tian et al. ; Arruda et al. ). Out of the strains tested in this study, only Enterobacter sp. (CNPSo 2480) did not produce siderophores. Siderophores produced by bacteria that promote plant growth may act through two mechanisms: directly promoting growth, as iron availability to plants is generally low, therefore organic chelators produced by bacteria will help absorption (Powell et al. ), and indirectly, by inhibiting the availability of iron to pathogens, thereby limiting pathogen growth (Ahmad et al. ). Lytic enzymes such as β-1,3-glucanases, cellulases, proteases, amylases and chitinases are connected to hyper-parasitic activities (Kim and Chung ) since they have the ability to degrade structural fungal cell walls (Oppenheim and Chet ). Pectinases, as well as cellulases, also assist in penetration of bacteria into the plant host. They can also promote the induction of systemic resistance (Hallmann et al. ). In our study, these enzymes were detected in strains of the genus Bacillus, corroborating Ratón et al. (). The inhibitory action on fungal pathogens can also be related to the ammonia released by bacteria, as reported by Fravel () with Enterobacter cloacae on Verticillium dahliae and Pythium ultimum. In Brazil, among the field phytopathogens that affect corn, F. verticilliodes is the most common (Peixoto et al. ). The following pathogens are also common: C. graminicola, B. maydis (Pinto ) and C. zea-maydis, and have become more important in recent decades in Brazil (Pereira et al. ). Among the strains tested in our study, Bacillus sp. CNPSo 2477 and CNPSo 2476 were the most efficient in the inhibition against all four fungi tested. They are known to have an antagonist effect against various fungi, for example, F. moniliforme, F. graminearum, M. phaseolina (Pal et al. ), F. oxysporum and Colletotrichum truncatum (Araujo and Guerreiro ). One of the advantages of the biological control strategy using endophytic bacteria is that they can act in the same niche, in direct competition with the pathogens (Bacon and Hinton, ). 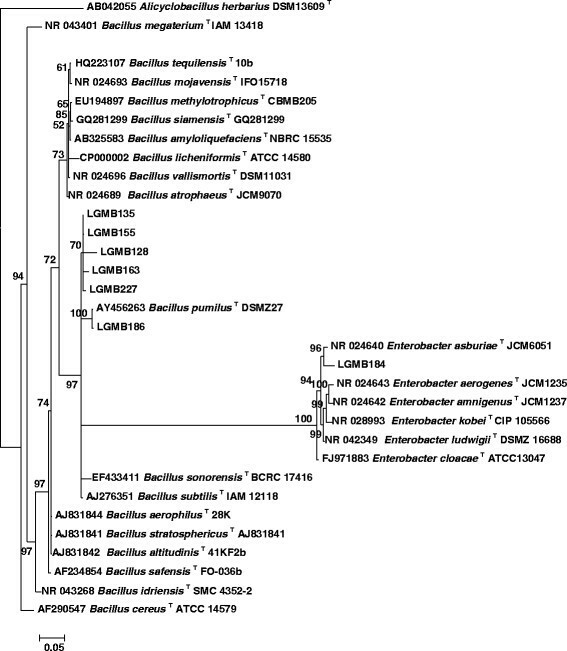 Based on the 16 s rRNA sequence, the endophytic bacteria from our study were identified as Enterobacter asburie and Bacillus pumilus, while the other strains were confirmed as belonging to the genus Bacillus. We found that Bacillus CNPSo 2477 and CNPSo 2476 have good antagonist performance against corn phytopathogens. We also showed that Bacillus sp. CNPSo 2481 and Enterobacter sp. CNPSo 2480, have shown the ability to promote plant growth, leading to increases in the percentage of seed germination and improving the early development of seedlings. Therefore, these strains are very promising for use as inoculants in corn. Future studies are needed to test the biotechnological potential of these strains under field conditions, in the hope that they will contribute as an alternative source of biological fertilizer and biological control. It is also interesting to investigate which mechanisms would be related to fungal inhibition activity detected in our study. Our thanks go to: Semilia Genetics and Breeding LTDA, specially Dr. Francisco Terasawa Junior, for experiments in obtaining fungal strains. Also, the team of the Biotechnology Laboratory of Embrapa Soybean Soil, namely Jacqueline Delamuta and Renan Ribeiro, for support with the sequencing. Renata Rodrigues Gomes and Maicon Wons Andrew Fernandes, for their help in the antagonism tests. This work had financial support from the National Council for Scientific and Technological Development (CNPq), Project Repensa (562008/2010-2) and Coordination for the Improvement of Higher Education Personnel (CAPES). All authors declare have no competing interests.